Who said 9.5mm is dead? Take a look at this beautiful looking Pathescope GEM, with bidding currently at $600.00 with 5 days to go! That puts it in the GS1200 league! What a beauty! I have always thought the GEM was a stunning looking machine, particularly when decked out with its 900ft reels. Looks like one for Trev! Well Kev, if it is a sander it's a very high priced one! It will be interesting to see what this will go for, with 5 days left on the auction. It looks like a pristine machine, maybe the best example of a GEM still in existance! Some people want it real bad for the bidding to be this high at this point in the auction. I'm profoundly ignorant of 9.5mm, but always willing to learn. It is certainly a thing of beauty! A bread box with a heat lamp built in! Genius!! 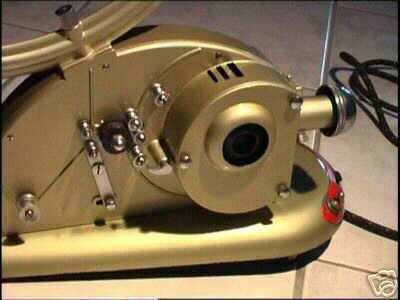 The GEM was first produced by Pathescope (Great Britain) in 1948. It was a major design inovation by Pathe with, as you can see, a beautiful and unique 'art deco' design. It was probably the first projector anywhere to use efficient low voltage 12 volt 100 watt lighting. It can take 900ft reels for about 30 minutes of uninterrupted viewing. 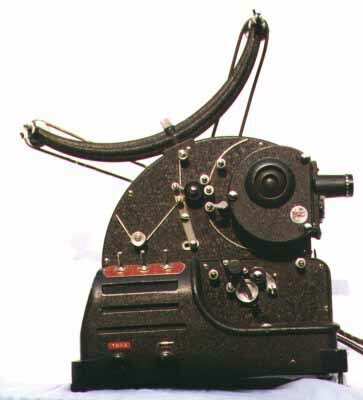 Pathescope later produced a sound version of this projector called the 'Son', which was also a distincly beautiful looking machine, but unfortunately was a troubled design in the area of sound quality. 9.5mm sound film has a narrow optical track running down one edge of the film. 9.5mm picture quality is about as good as 16mm, because of the large picture area acheived by the use of center sprocket holes. The Gem has a pretty appauling lens,about f16 Id say Also,the motor is mounted on rubber dampers which have well and truely perished by now-leaving a "freefloating" motor! I'm not to keen on feeding valuable 9.5mm film to my Pathescope beasts...With the Son(a Gem on an amplifier to a philistine like me),you can work up a sweat keeping the exciter lamp lens focused on the sound track-one of those perpetual adjustment scenarios-I find. Well it went for $600.00! Not bad for a 50 year old silent projector. Looks like Pathescope and 9.5mm equipment and films are increasing their value quite rapidly.